PREFACE: This article looks at the *charging times & achieved state of charge of an AGM battery in multiple scenarios. *DISCLAIMER: This test represents this slightly used AGM and may not be representative of a brand new AGM or a battery with more use and in a worse state of health. “C” Rate – .2C & .4C – Also called Point Two C and Point 4C. This is just represents a percentage of Ah capacity in either charging or discharging current. For example .2C = 20% of Ah capacity or 20A for a 100Ah battery and .4C = 40% of Ah capacity or a 40A charge or discharge current for a 100Ah battery. SOC = Sate of Charge – SOC is a percentage of charge based on battery Ah capacity. DOD – Depth of Discharge – Is the depth to which the battery has been discharged. For example 80% DOD is also 20% SOC or 80Ah removed from a 100Ah battery. Ah Capacity = Ampere Hour Capacity – The total ampere hours a battery can store and deliver at a discharge rate that yields a 20 hour discharge time at 77F before hitting a terminal voltage of 10.5V. How long does it take to charge from 50% SOC to 100% SOC? I have long known that a higher charge rate, with AGM batteries, does not necessarily translate to *significantly faster charge times from 50% SOC to 100% SOC and thought it would be good to test this and measure the actual differences. For the first part of this test, 50% SOC to 100% SOC, I compared a charge rate of .2C with a charge rate of .4C on the same Lifeline GPL-31T battery. “*Significantly Faster” – Please understand, & take with a grain of salt, what I am comparing “significantly faster” to. I was once told by a quite vociferant expert on AGM batteries, “expert” defined here as a boat owner who had AGM batteries and whom had read only the glossy marketing materials, (grin) that with his 150A alternator he could recharge his 440Ah bank of AGM batteries from 50% to 100% in less than an hour and a half! Apparently the marketing departments don’t have prerequisites of chemistry 101, Ohm’s law or physics 101? While the owner was fully capable of basic math, and actually a nice guy to boot, 1.5 hours times 150A = 225Ah’s, he failed to take into consideration that his .34C 150A alternator could not put out 150A for 1.5 hours and his bank, at anywhere close to .34C, would hit absorption voltage rapidly and begin limiting alternator current. He also failed to include for a declining CAR or what is referred to as the charge acceptance rate. Even if his alternator could run at at a face value of 150A it is simply impossible to return 225Ah’s to that bank in 1.5 hours from 50% SOC. I will repeat this, IMPOSSIBLE! One can’t really can’t blame this owner for his rather misguided expertise because he had been rather grossly mislead by nearly everyone in the industry on the expected charge times from 50% SOC to 100% SOC with AGM batteries. Suffice it to say it is physically impossible to recharge a 440Ah bank of AGM batteries at 50% SOC to 100% SOC in 1.5 hours with a .34C charge current. In this image we have removed 48.54Ah from the battery which tested at 95.69Ah’s of actual capacity. This leaves the battery at 49.3% SOC or just about 50% SOC. Voltage was used as the cut-off and 12.100V at 5.25A was the stop point for the discharge testing. Voltage as a cut off , at a known constant load and battery temp, is actually extremely repeatable. The battery used for this testing is a 2015 Lifeline Group 31 AGM Deep Cycle battery. 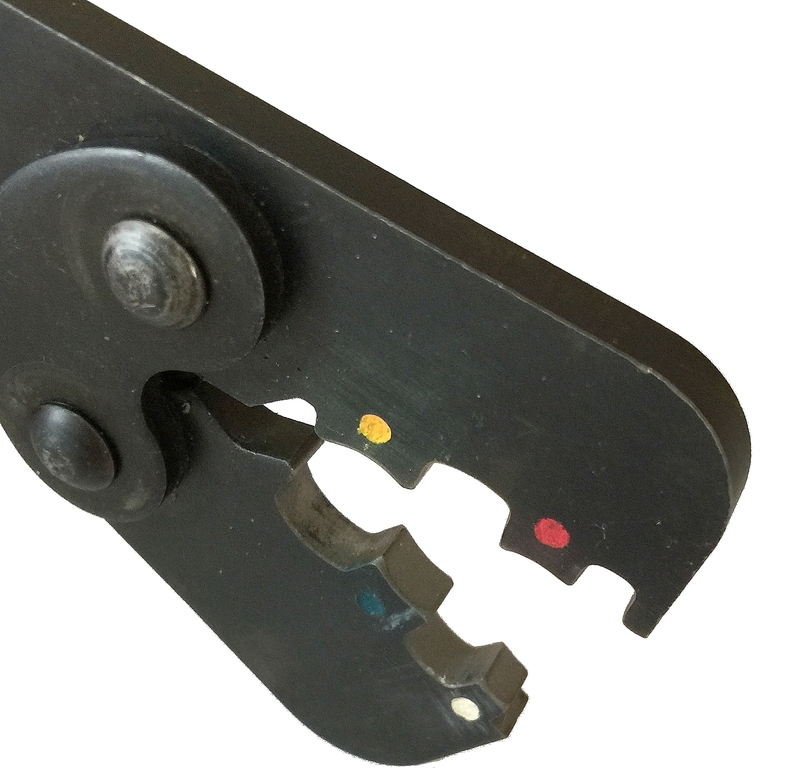 It had been used for approx 5 months as part of a bank on a power boat (trawler type) that cruises Maine and resides on a mooring. Once here in my shop it was cycled to 80% DOD then back to 100% SOC twice. It was then equalized at 15.5V for 4 hours, (Lifeline calls this conditioning). 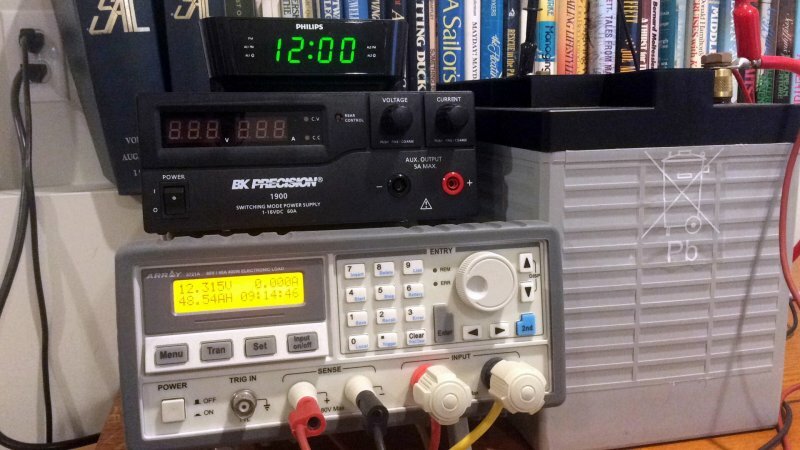 The battery then underwent one 20 hour discharge capacity test and was then cycled to 50% SOC and back to 100% SOC, 3 times and another 20 hour capacity test was run. The average of the two 20 hour capacity tests was used as the baseline Ah capacity. The baseline Ah capacity of this battery was 95.69Ah. Throughout testing the ambient temp of the battery averaged about 75.2F. While not 77F, the 75F temp should not have negatively impacted the testing. The battery has a rated Ah capacity, at 20 hours, of 105Ah. For charge and discharge rates I kept them based on the “as new” capacity rating, just as many boaters would do, to keep the test a bit more “real world“.. The battery is rated at 105Ah so -5.25A was the discharge rate used. The test was set up to try and simulate real world use on cruising boats. For the .4C charging test the timer was reset to 12:00 and an image was snapped using an intervalometer at 2 minute increments. At 2 minutes the voltage at a .4C charge rate had already risen to 13.6V. This image shows the charger almost ready to exit bulk charging and enter absorption charging. If you look closely, on this lab grade power supply, you can see a little red light next to the letters “CC”. This means constant-current or BULK charging. Bulk charging is the most efficient part of the recharging process with efficiencies ranging close to 100% of energy delivered by the charger being usable and stored. For AGM’s I have seen this anywhere from 96% to over 99.5%. Once the charge process switches from constant-current/bulk to constant-voltage/absorption, the charge efficiency continues dropping. In the high 90% SOC range we are converting a lot less of the supplied energy into stored energy. Charge efficiency is not a simply single data point number such as 20% efficient or 10% efficient. The Coulombic efficiency varies through the charge curve and is why getting all lead acid batteries back to 100% SOC, including AGM & GEL, takes a long time. 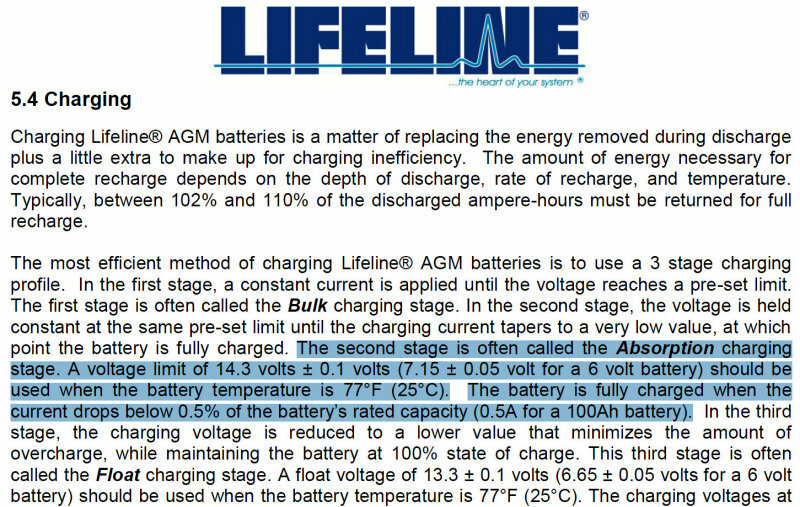 If you read the highlighted part of the Lifeline Battery Technical Manual you will see that Lifeline correctly understands the difference between BULK and ABSORPTION charging. Many companies, including Balmar and some others, do not correctly understand using the word “BULK”. When a company tells you that “bulk” is a voltage limited stage of charging this is PURE MARKETING BOVINE DUNG. Simply put, bulk=constant-current charging not constant-voltage. BULK – Bulk Charging is the constant current stage of charging where the charge source is limited only by what it can deliver in current. Bulk charging is not a voltage limited stage of charging despite many companies bastardizing the term bulk for apparent marketing purposes. ABSORPTION – Absorption, float and equalization are all examples of constant voltage charging stages. Absorption or constant-voltage is where the charge source holds voltage steady, hence the term “constant-voltage”. Once voltage is held steady, or it becomes voltage limited, current begins to decline and the charge efficiency worsens as SOC increases. Float charging is a further reduction in the constant-voltage limit and an equalization voltage would be an increase in the constant-voltage limit of charging. Please remember that bulk is not a voltage limited stage of charging it is constant current. Based on this image, and the data logger, I know the battery attained 14.4V at around 19 minutes. Here at 20 minutes, with the voltage now held steady at 14.4V (green CV/constant-voltage light on) we can see that the charge current has already dropped from 42A to 41.5A or a .5A reduction in accepted charge current into the battery. If you’re paying attention this battery, when charged at .4C from 49.3% SOC, stayed in BULK/CC for 19 minutes and entered ABSORPTION/CV charging, where current begins declining, at 63.3% SOC. If you’ve listened to net lore or dock lore for years, as I have, we all know AGM’s “don’t come up to absorption until 80-85%” right? Wrong…. The point at which any battery becomes voltage limited or attains the absorption voltage is entirely dependent upon the charge rate you are feeding it. This clearly charge rate shows very clearly how charge current affects the SOC transition point from bulk to absorption charging. By 1 hour in, our 42A or .4C charge current has already declined to 19.5A.. Here we are at 3 hours and the accepted charge current is now down to 2.8A.. That last few % takes the longest due to declining CAR. 100% SOC was deemed as 0.525A flowing into the battery at 14.4V per the Lifeline Battery Technical Manual. At a .4C charge rate it took this fairly healthy, though not perfect, group 31 battery 5:30 to reach 100% SOC from 49.3% SOC. For this test 12.100V was also used as the cut off voltage after a full 100% recharge. After a full recharge at 14.4V battery then spent 32 hours at a float voltage of 13.4V. It then had a 24 hour resting period. The battery delivered -48.33Ah or just about where it had on the previous test which ended at -48.54Ah. As we can see in this image, at 2 minutes, the .2C charge rate only has the battery to 13.1V vs. 13.6V at a .4C charge rate. The voltage is climbing slower in bulk at .2C than it did at .4C. This is to be expected. At 1 hour the battery voltage has only risen to 13.8V at a .2C charge rate. The .4C charge rate had attained 14.4V within 19 minutes. If this was your alternator it had better be robust enough to deliver its full output for at least 1 hour straight. In this case, as you see next, it is 1:16 minutes before your alterntor would even begin to catch a break. A charge rate of .2C on a 450Ah bank, a pretty typical bank on a coastal cruiser these days, is an alternator that can deliver 90A continuously, even when hot. At 1:16 the battery finally attained 14.4V and the current had begun dropping. This battery, when charged at .2C from 49.5% SOC, stayed in BULK/CC for 1:16 minutes and entered ABSORPTION/CV charging, where current begins declining, at 77.4% SOC. Once again this clearly shows how charge current affects the SOC transition point from bulk to absorption charging. At .4C the battery attained absorption voltage at approx 63.3% SOC and at a .2C charge rate it attained absorption voltage at approx 77.4% SOC. See batteries don’t just automatically attain the absorption point at 80% SOC it all depends upon the available charge current..
At 2 hours the charge current is down to 11A..
At 3 hours the battery is now accepting just 4.2A. At 4 hours the battery is accepting just 1.6A.. 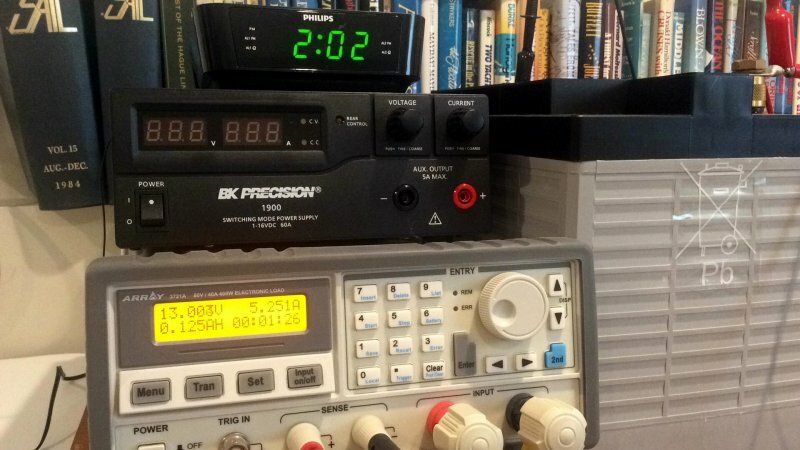 The key piece when charging your batteries is how to determine when you are at 100% SOC. Some battery manufacturers give “*tail-current” or “*return-amps” in their technical manuals, Lifeline battery is one of them..
*Return-Amps” / “Tail-Current” – This is the amount of current flowing into the battery at ABSORPTION VOLTAGE where one can pretty safely determine 100% SOC. Using return amps, at absorption voltage, (not float voltage) is usually the easiest method to determine 100% SOC when out cruising. This image is a screen capture of the Lifeline Battery Tech Manual. I have highlighted the important part for net return amps determining 100% SOC. It is saying; A voltage limit (absorption voltage setting) of 14.3V to 14.4V should be used when the battery temperature is at 77F, this battery was at about 75F. When voltage is steady at 14.3V to 14.4V the battery can be deemed 100% full when charging-current,/tail-current/return-amps declines to 0.5% of Ah capacity. When 14.4V and 0.525A were attained is when I deemed this battery at 100% SOC. Technically, the battery was only at 95.69Ah so I should have used 0.48A but close enough for this experiment. 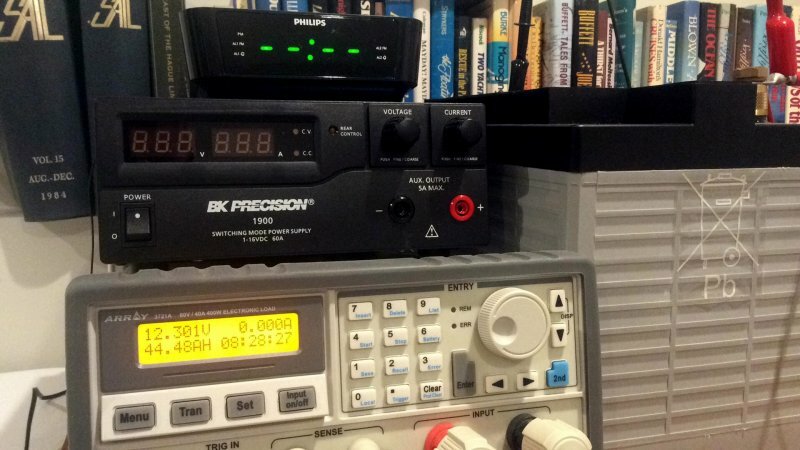 It is important to note that some sources claim a tail-current of 2% @ absorption voltage will yield 100% SOC. 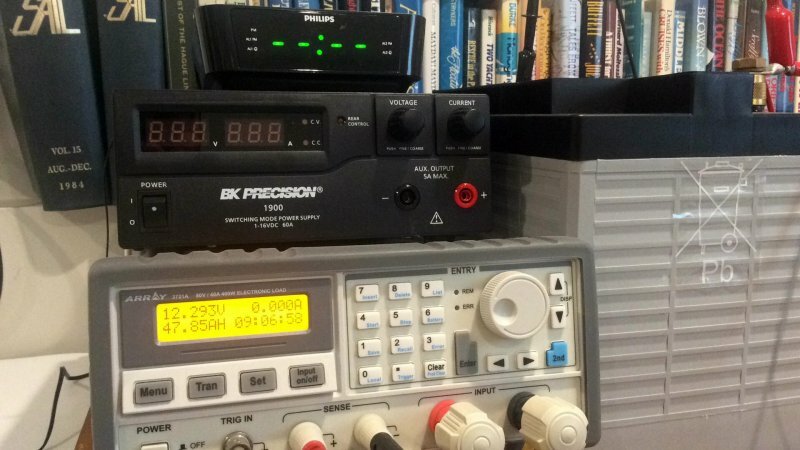 Odyssey, Northstar and East Penn/Deka all wanted to see 0.3% @ absorption voltage for the Practical Sailor PSOC testing. Lifeline wanted 0.5% and for Firefly we stopped at 0.5% as well. 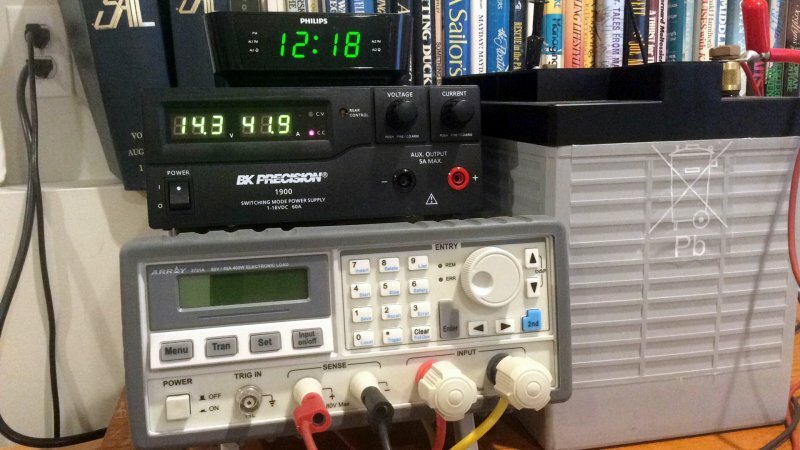 Over many years of capacity testing hundreds and hundreds of batteries, flooded, GEL and AGM I have yet to see a lead acid battery that could delivers its full storage potential at anything less than 0.75% in tail current at absorption voltage. 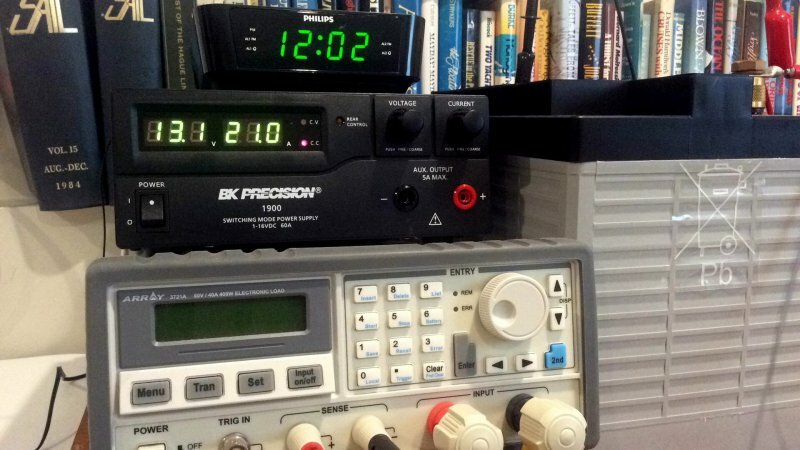 My best research of antiquated data and materials suggests that 2% @ Absorption voltage originated from the Ah counting industry not from batteries actually being “full”. Here we are at 100% SOC at the .2C charge rate and it took 5:42 minutes. Yes, it took longer to attain 100% SOC (per Lifeline battery tech manual) but that time was only about 12 minutes different with double the charge rate. Both charge rates on this pretty healthy AGM battery took 5.5+/- hours and I have repeated this test with AGM batteries is worse shape that exceeded 7 hours to attain 100% SOC, likely due to sulfation. IMPORTANT: Please understand that you will never likely charge this fast with a typical smart charger. Take for example the .4C charge rate. At 19 minutes it hit absorption voltage. Many so called “smart chargers” begin a timer, I call it an egg-timer, once absorption voltage has been attained. If that egg-timer clock started at 19 minutes, and was 2 hours long, the charger would have dropped to a float voltage of 13.4V at 2:19! OUCH!!!! Smart? Hardly! Murderous to your marine batteries? You bet! Considering it took 5:11 minutes of absorption charging at the .4C charge rate your batteries would likely end up grossly under absorbed, under charged and would not last very long. Once we reduce voltage, eg: dropping to float prematurely, I call this premature-floatulation, we dramatically EXTEND charging time to 100% SOC. In my shop I use adjustable power supplies to avoid dumb so called “smart chargers”. With a fully adjustable power supply I can control when the battery changes from absorption to float and not rely on an egg timer. If I desire a timer cut off I simply program a digital wall timer. Is too much current bad for an AGM Battery? For AGM batteries generally speaking the more charge current the better the longevity of the bank. It helps, not hinders, with overall longevity to charge at high rates. Higher charge rates in AGM batteries actually yields longer life not shorter life. Dave V. the lead engineer at Lifeline battery published a study supporting higher charge rates being good for AGM’s a long time ago but it still holds true today.. Odyssey battery, thin plate pure lead AGM batteries, wants to see a minimum of .4C in charge current and Lifeline wants to see a minimum of .2C as recommended charge current. The study then goes on to suggest that a balance needs to be met between equipment and optimal cycle life. Today Dave suggests a minimum charge current of .2C for Lifeline AGM’s. It is a pretty rare boat that can muster a .4C charge rate, but some do. On a 450Ah bank that would be an alternator or large inverter/chargers that could sustain 180A when hot. Unless the boat has a massive Electrodyne alternator or multiple stacked “Combis” (inverter/chargers) it is quite rate to see even a 200A continuous charge rate. You as a boat owner will have to decide what it’s worth in terms of equipment costs to charge your AGM’s at high charge rates. The eternal question of “Do AGM’s charge faster with high charge rates applied?” seems to still be open for debate. This battery only saw an approx 12 minute difference in a 5.5hour charge period but yes it did charge “faster” at .4C than it did at .2C. Double the charge current to shave 12 minutes? It may be worth it to some, but getting to 100% is not the whole story…. The importance of getting back to 100% SOC, as often as possible, can not be over emphasized. 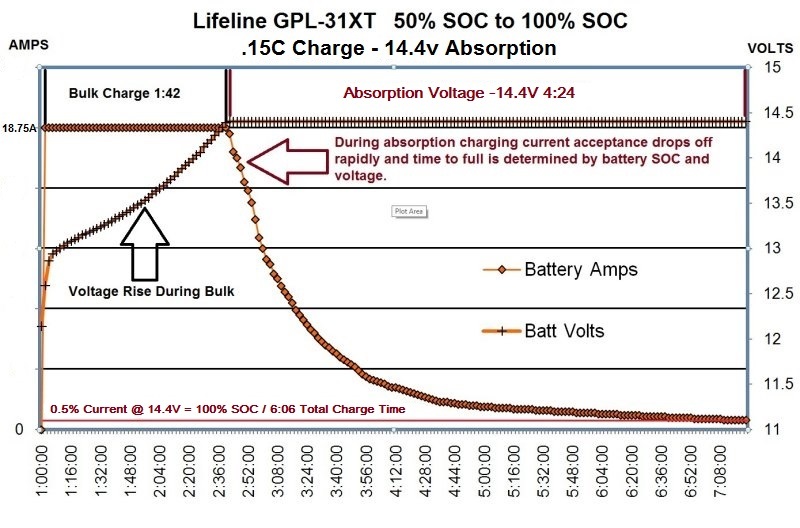 Here Lifeline Battery is referring to the “walk down” effect of PSOC use (*partial state of charge cycling). By not recharging to 100%, as often as possible, your Ah capacity will gradually “walk down” as sulfation becomes permanent and ruins them. SUMMARY: In this portion of the testing 50% to 100% SOC, on this AGM battery, the difference between a .4C and a .2C charge rate, netted a 12 minute total charge time difference. *For more information on the effects of PSOC cycling AGM batteries please read the May 2015 and August 2015 issues of Practical Sailor Magazine. In this second part of the testing I am replicating a few typical scenarios for recharging on a cruising boat. No one wants to run the engine or generator for very long so I wanted to illustrate what kind of energy can be stored in the AGM battery at a 2 hour time interval at a .2C charge rate. This test started with a discharge from 100% SOC to 50% SOC with the battery delivering 47.85Ah at a 5.25A constant current load. The battery was then recharged for exactly 2 hours at .2C and then discharged back to 50% SOC and the stored energy for that cycle was measured. At two minutes into the test at 21A the battery terminal voltage is at 13.1V. MYTH BUSTING: Think about this snap shot if you use or are considering a battery combining relay for charge management and are concerned or have been scared off by one of the many myths surrounding these effective and highly reliable devices. The myth goes something like this: By using a battery combiner, on AGM batteries, and feeding the alternator or battery chargers charging current directly to the house battery bank first, “it will leave your start battery under charged“. If you are practicing good battery management, and have even the minimum suggested charge current for an AGM battery, this is a complete non-issue. In 2 minutes of charging, at .2C or 20% of Ah capacity from 50% SOC, the AGM battery voltage is already at the “combine level” for the amazingly popular Blue Sea ACR. 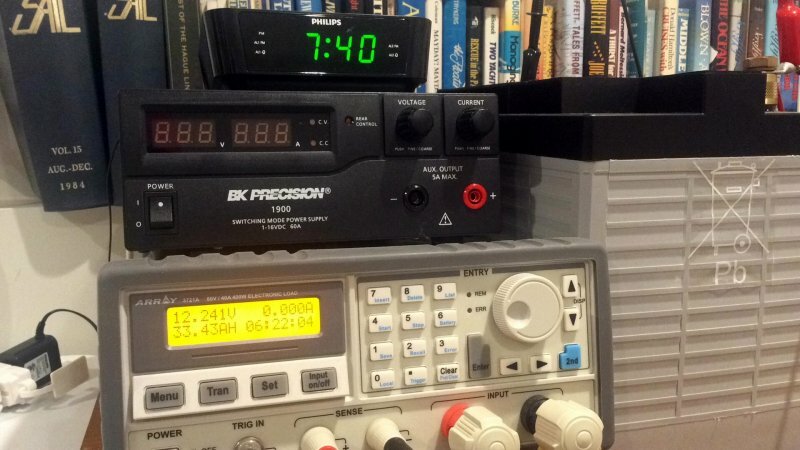 Battery voltage will rise pretty slowly from here on but to get to an ACR’s “combine level” is relatively quick and easy, especially if you have your system set up properly. The Echo Charger, Duo Charger and numerous other DC to DC chargers also turn on at similar voltages and those devices require all charge sources to be fed to the house bank. 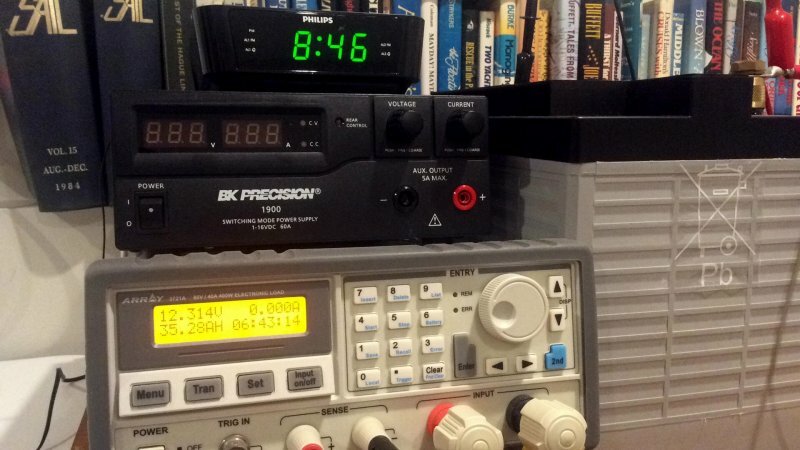 In this image the charge source is about to turn off when it hits the 2 hour mark. 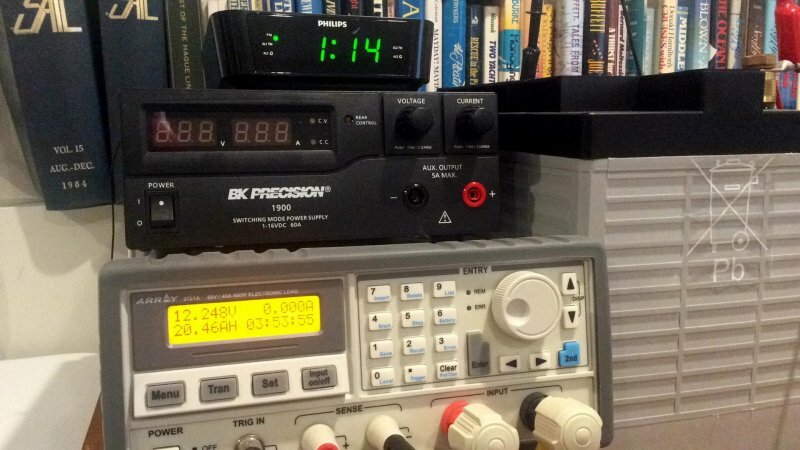 Net accepted current at 14.4V @ 1:58 is down to 11.6A. Here the electronic load has turned on and has now begun discharging the battery back down to 50% SOC. I did not pause and let the battery rest between charging & discharging because this is not actually done on cruising boats. The object with this test is to see how much usable energy we can store in the battery in two hours at a .2C charge rate..
After charging the battery from 50% SOC for two hours at 21A we were able to remove 35.28Ah’s and bring the battery back down to 50% SOC. Rather than bore you with multiple images that all look the same I am going to summarize the remaining three tests with the “stored energy” screen shot. This test was a .4C charge for two hours and when discharged back to 50% SOC, after the 2 hour charge, the stored energy removed was 44.48Ah. While not a heck of a lot more than .2C it is the attained SOC that really makes .4C different. PERSPECTIVE: Charging to 100% SOC took 5:30 minutes so this means the last 4% of returned energy took 3.5 hours to complete at .4C and the first 46% of capacity could be returned in 2 hours at .4C. The problem still remains that the last 4% is critically important to AGM longevity. This test was a .2C charge for one hour and then discharged back to 50% SOC, after the 1 hour charge. The stored energy removed was 20.46Ah from a max charge rate of 21A. 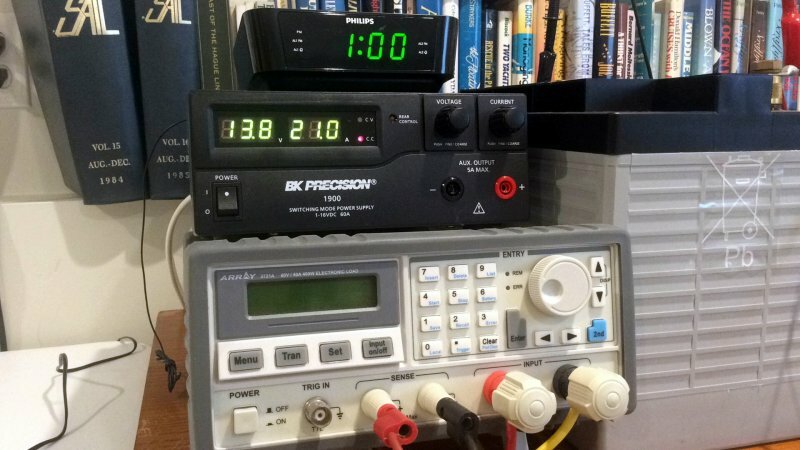 CHARGE EFFICIENCY: As I have mentioned before bulk charging, where the charge source provides its full current before the battery reaches the limiting voltage, is nearly 100% efficient. Here we have a 1 hour recharge at a charge rate of 21A where the battery was able to store 20.46Ah of that 21Ah delivered to the battery. A 21A charge for 60 minutes is 21Ah’s of supplied energy. This means 97.4% of the energy supplied by the charger, or the 21A for exactly 1 hour, was removable as stored energy when we discharged back to 50% SOC. On this 1 hour .2C recharge the battery never attained the absorption voltage of 14.4V and was still in bulk when the charger turned off at the one hour mark. Bulk is very efficient! SCALE IT UP: If we scale this test up, and it should scale well, a .2C charge rate on a 450Ah fairly typical cruising boats house bank would be a continuous 90A for 1 hour before your batteries even hit the absorption voltage set point. Yes, 90A continuously for 1 HOUR.. This is a metric $hit ton of work on a typical 90A – 120A alternator. 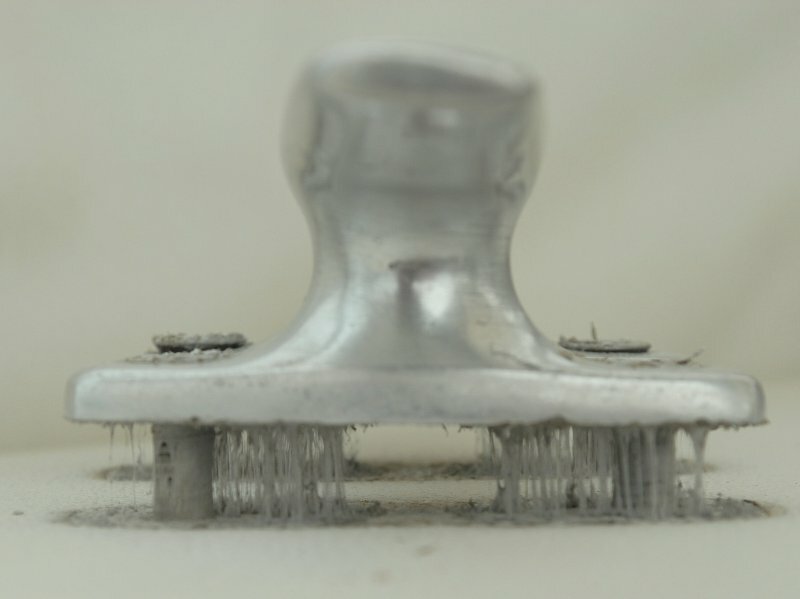 This is why many a boater has burned up their alternators charging AGM batteries. MYTH BUSTING: If you believe a battery monitor that counts Ah’s, and supplies a fixed charge efficiency number to the returned Ah’s (most all of them), can track your batteries accurately when you don’t recharge to 100% SOC with each cycle, this myth & lore is blown out of the water right here. In bulk this battery had returned energy efficiency of 97.4% yet the last 4% of returned energy, to 100% SOC, takes 3.5 hours! There is a major difference in charge efficiency throughout the SOC curve. Charge efficiency is not linear throughout the SOC curve, but most all battery monitors are linear in their application of charge efficiency. They simply apply a negative count factor for charge efficiency as the Ah’s are returned. For example if we return 10Ah’s with a 90% charge efficiency setting the battery monitor will only show that as 9Ah’s returned. If we were to stop charging in bulk we really do have closer to 10Ah’s returned. Do this a few times…….. Ouch! When you cycle more than a few times in the 50% to 90% SOC range there is no way for a typical Ah counter/battery monitor to accurately track your charge efficiency. For more info on this see the article on “Programming a Battery Monitor”. RESULTS: The battery achieved approx 71% SOC in one hour at a .2C charge rate. 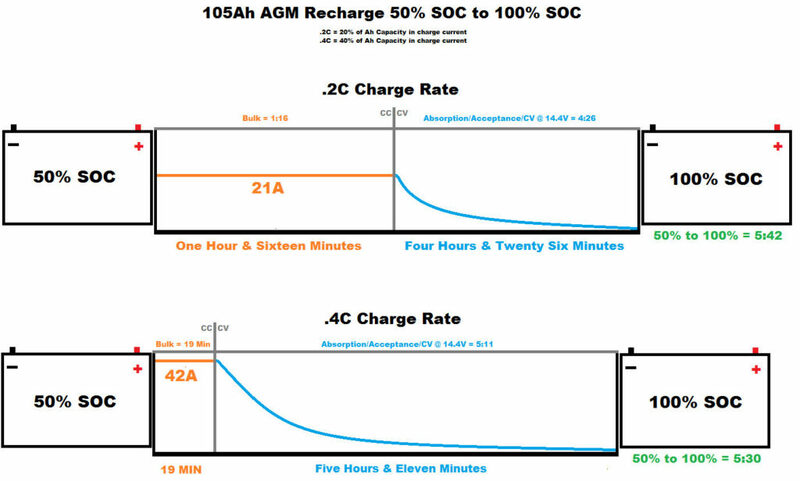 PERSPECTIVE: It is pretty clear that a 1 hour charge at .2C is an inadequate charge rate for AGM batteries that are routinely discharged to 50% SOC, unless you really like hearing your motor or generator run. NOTE: Lifeline Battery recommends a .2C charge rate as the bare minimum for these expensive AGM batteries. Odyssey TPPL AGM batteries are recommended to be charged at a minimum of .4C. This test was a .4C charge for one hour and then discharged back to 50% SOC, after the 1 hour charge. The stored energy removed was 33.43Ah from a max charge rate of 42A. SCALE IT UP: If we scale this test up, and it should scale well, a .4C charge rate on a 450Ah fairly typical cruising boats house bank would be a continuous 180A. This battery hit the absorption voltage point at approx 20 minutes when charged at .4C from 50% SOC. 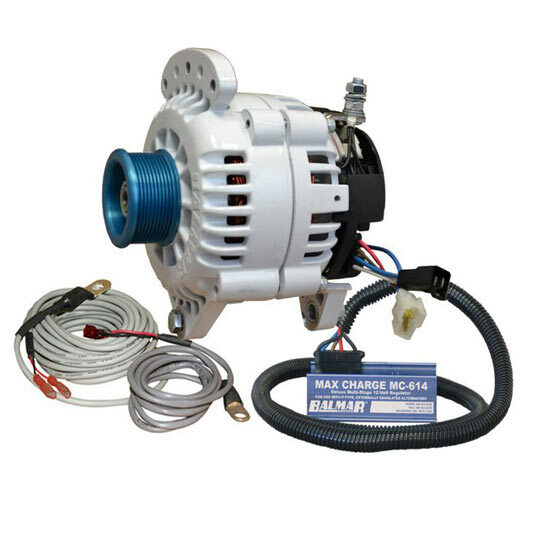 With a .4C charge rate your alternator or charger would only be in bulk, or running at its full output, for approx 20 minutes. While this certainly does not make the most efficient use of the alternator, or inverter/chargers, or generators it does charge the batteries to a higher SOC in a short 1 hour run. RESULTS: The battery achieved approx 85% SOC in one hour at a .4C charge rate. PERSPECTIVE: While .4C certainly does attain a higher level of SOC in 1 hour, approx 85%SOC, the gain in SOC makes pretty ineffective use of a .4C charge source while only utilizing it at 100% output for about 20 minutes. Most boaters charging AGM batteries would likely benefit from a compromise charge source current of about .25C to .35C for 1.5 – 2 hours +/- per day. Blended with solar you can get the bank to 85% SOC or so and let the solar take over for the long slow crawl back to 100% SOC. Here is another way to look at the charge process with a doubling of charge current. In this diagram Bulk/CC is the orange area and Absorption/CV is represented by blue. NOTE: The blue charge acceptance curves are illustrative only. All times and voltages are accurate and taken directly from data points used in this test. Here is another way to look at the charge process. This was a *Lifeline GPL-31XT battery (125Ah rated that was charged at .15C or about 15% of its rated Ah capacity. *NOTE: This was not the battery being tested in this article, and it was used. This image is just for just for illustrative purposes.. BULK: If we start at the top left of the chart we can see that the current held rock steady at 18.75A for *1:42. This current, 18.75A is .15C or a 15% charging current of a 125Ah battery. *NOTE: 1:42 of bulk charging (your alternator running at full bore) is more than enough to damage an alternator not otherwise protected for temperature or current limited to protect it. A charge rate of .15C would be an 80-90A alternator on a 400Ah bank, when accounting for the “hot” output, and not all that uncommon. I see lots of burned up alternators when they are under sized for the task. VOLTAGE RISE: If we look at the left side of the chart we can see the voltage climbing to the absorption set point of 14.4V. It took 1:42 at 18.75A for the battery voltage to attain 14.4V. 1/3 From Left: This is the point where the charge current and voltage flip-flop. Voltage stops climbing and is held steady, and current changes from being steady/constant to declining. 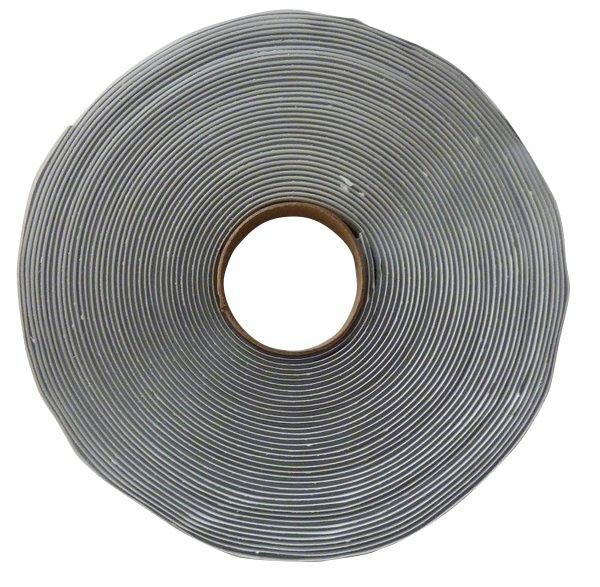 Once the BULK/constant current charge has driven the battery voltage to the absorption voltage limit, the voltage is now limited or held steady and the charging current begins to decline. CHARGE TIME: As current declines, out towards the lower right of the chart, the time it takes to get that last few % in takes significant time. At .15C this slightly used AGM took a bit over 6 hours to reach 100% SOC. I have had sulfated AGM batteries take 7+ hours even at a higher .2C. The health of your AGM battery can impact your time to full. DISCLAIMER: All batteries will test & perform differently based on age, type, chemistry and state of health. This battery and test are only really representative of this battery and test but should give some decent guidance as to what one may expect from a slightly used AGM battery. I purposely did not test a brand new AGM because that is not at all representative of what we as boaters have in use on-board our vessels for more than a short period of time. New batteries will perform differently but our batteries on boats rarely stay new for very long. Good luck & happy boating! !